May God console you among the other mourners of Zion and Jerusalem (Ha'makom yenahem etkhem betokh she'ar avelei Tziyon vi'yerushalayim). At Temple Isaiah we uphold the importance of belonging to the Jewish community by supporting you when you have lost a loved one. Your Rabbis, Cantor, and community all wish to help you find your way back to wholeness. After losing a loved one, it is important to call the funeral home where the burial will take place. They will help you arrange many of the details. It is also important to contact the temple so that you may consult with the clergy about setting a time for the funeral and burial. Once a time has been set, the Clergy officiating at the service will want to spend time with the family to know the person being remembered. At this meeting, the Rabbi or Cantor will help you go through the service and the various stages of mourning. Any questions you have may be answered at this time. It is customary to observe the period of Shiva. This is the first seven days following the loss of a loved one. The family may request to hold a minyan (prayer service) at their home during this time. The officiating rabbi or cantor will help make these arrangements with you. The Shiva minyan serves as a way to help the mourner gradually find wholeness. The prayers said during this service and the opportunity to share memories with visitors from the community all help to bring comfort to the bereaved. An unveiling is the placement of a marker or gravestone at the place of burial. This takes place close to eleven months after burial; however, arrangements can be made to observe this occasion at other times. If you wish, the Clergy may be present with you at this ceremony. Some members choose to have an intimate gathering and lead this service themselves. Your Clergy are happy to assist you and guide you in this process. The Yizkor service is observed four times during the year, during Yom Kippur, at the conclusion of Sukkot, at the conclusion of Passover and on Shavuot. During this service, those who have lost a loved one at any point in their lives may come to recite the Yizkor prayer. A special Memorial candle designed to last 7-days should be lit directly following the interment or memorial service. That candle is to remain lit until it burns out. This candle is often provided at the time of the funeral. Every year at sundown preceding the start of Yom Kippur and at sundown preceding the last day of the holidays of Sukkot (Shemini Atzeret), Passover, and Shavuot. These times are when the Yizkor (Memorial Prayer Service) usually occurs in synagogues. 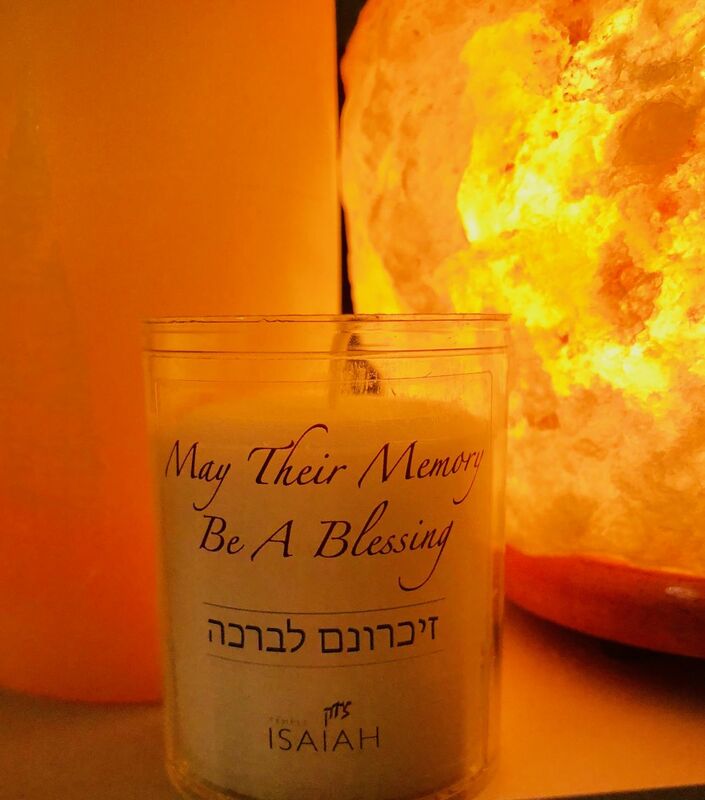 Temple Isaiah will provide you with a Yahrzeit candle if you need one. If you will be leaving the candle unattended be sure to place it on a safe surface. We know the importance of remembering a loved one. We want to share the stories of how you make your loved ones’ memories a blessing. On Saturday, July 21, 2018 we filmed short interviews with members of our community. We crafted a short video exploring our community’s practice of mourning and memory. You can listen to our Podcast to find out more about how this project was conceived and you can watch the video below. For more information about mourning, please click here. We invite everyone who has lost a loved one to contact any of our Clergy for initial support and guidence.